The older of the two Muzychuk sister chess prodigies, Anna Muzychuk has risen to quickly become the fourth best female player in the world at a young age. Before this though, she methodically worked up the rating charts, achieving every single one of the FIDE titles in order and also winning plenty of girls age championships along the way. She’s played in the Women's World Championship twice, coming up short each time, but continues to be a force to be reckoned with. Anna Muzychuk learned to play chess when she was a young kid, becoming the under-8 European champion in 1996. She became a Woman FIDE Master in 2001 and then a Woman International Master in 2002. Her biggest achievements as a child were when she won the Women’s Ukrainian Championship in 2003, the U20 Girls Championship of Ukraine in 2004 and the World U16 Girls World Championship in 2005. 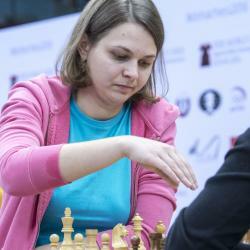 In between these tournaments, she became a Woman Grandmaster in 2004. She followed up these tournament successes with getting the official International Master title in 2007. In 2008 and 2010, she competed in the Women’s World Championship, falling short of the finals match each time. More recently she has become an official Grandmaster in 2012 and has also had some good tournament results as well, ranking her as the fourth best female chess player in the world. Her sister, Mariya Muzychuk, is also an accomplished chess player.